Private shuttles from Aeroporto di Capodichino (Airport) or Stazione Centrale di Napoli to Sorrento must be pre-booked. More information can be found at www.cooperativatasso.com or can be provided upon request from nello.iacomino@hotmail.it. You will find a taxi rank outside Arrivals in Capodichino airport . 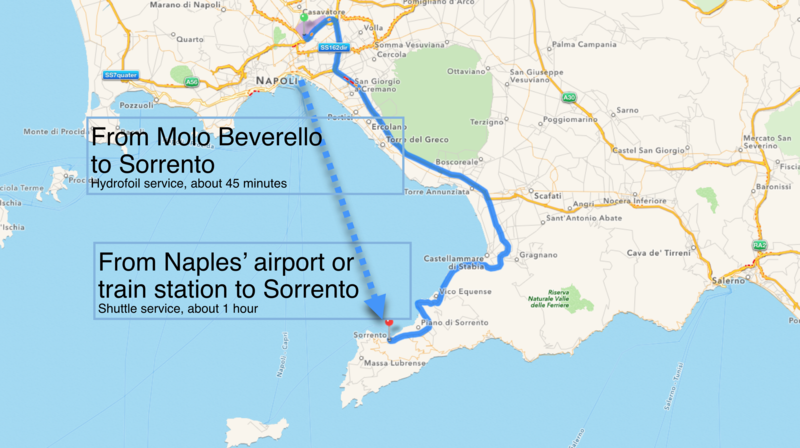 However, Sorrento is located outside the Naples area, so there is a very high surcharge. N.B. Do not take a taxi unless you have chosen the fixed price option for Napoli – Sorrento and agreed this with the driver. (approx.. 110 euros one way). Otherwise, it will be extremely expensive. All official taxis have a price list in English and Italian. This comfortable coach service provides an efficient link to the Sorrento peninsula. Tickets can be purchased directly on the bus. From the airport: take a taxi from outside Arrivals. From the train station: take the subway to Municipio stop or go by taxi. Ticket price for hydrofoil: approx. EUR 13,00 per person one way (additional charge for luggage). N.B. Please, remember that departures depend on weather/sea conditions.